The Austria glider was commissioned by the Österreichischer Aeroclub to compete in the 1960 OSTIV competition for a Standard class sailplane. First flown on 5 august 1951, it is a mid-wing glider of conventional design with a welded steel fuselage structure and a wooden wing. It is a glass fibre competition sailplane in the Standard class produced in Germany mid-sixties. The « Jeunesse » is originally a hang-glider that could be easily be built by any aviation amateur. The B.A.P.A. example was built by Daniel Pletinckx who modified the « Jeunesse » with a seated position for the pilot and the possibility to fit a small engine on the nose. This one was never fitted. The Slingsby T.38 Grasshopper is a British primary training glider built by Slingsby Sailplanes for the Royal Air Force. 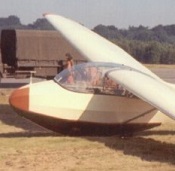 The design is based on the pre-World War II German SG 38 Schulgleiter, modified to use the wing design of the Slingsby T.7 Kirby Cadet glider. The design was cheap to manufacture and was designed to be stored dismantled. The Zogling primary glider was designed mid twenties by Fritz Stamer and Alexander Lippisch who worked together at the Aeronautical Department of the Rhön-Rossitten Gesellschaft (RRG). Drawings were spread in USA and England where Reginald Dagnall led his company RFD of airship building.